Francine's Friends: We are HAPPY! 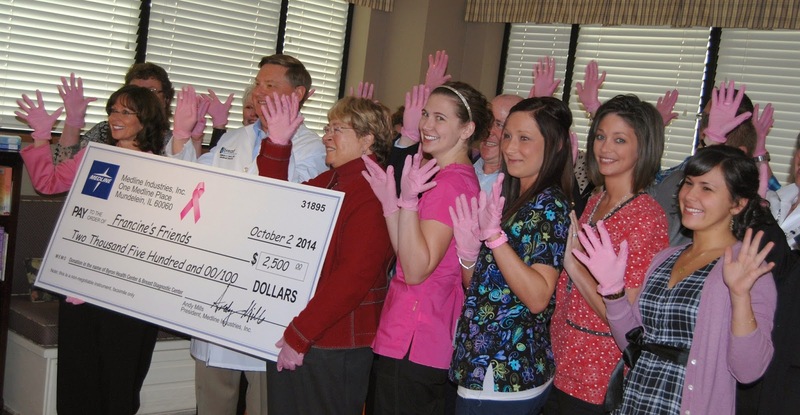 Byron Health Center and Breast Diagnostic Center announced that their joint entry finished in third place in the national 2014 Pink Glove Dance for Breast Cancer Awareness video contest. Featuring more than 150 local healthcare workers dancing to Pharrell Williams’ hit song “Happy,” the 90-second video was shot in several iconic Fort Wayne locations and produced by Punch Films. Winners were determined by an online vote. “We are thrilled the video reached so many people to emphasize the importance of early breast cancer detection,” said Dr. William Petty, BDC medical director. In addition to the $2,500 prize money presented to Francine’s Friends on October 2, the all-volunteer organization also received $1,000 from Byron Health Center and $1,000 from Breast Diagnostic Center to help fulfill its mission to provide screening mammography for all women in northeast Indiana. "Today our magic coach video came in third in our category for the Pink Glove Dance!" exclaimed Sharon Simmons, board president of Francine's Friends. "Asher Advertising, Punch Films, Byron Health, and BDC all deserve our special thanks for the hard work they devoted to making our first experience with the Pink Glove so memorable," she continued. "Thank you to everyone who reached out to all your friends, relatives, and professional contacts and had them voting for us each and every day — it was amazing! I know I had a wonderful time being a part of this video and I hope that everyone else involved enjoyed it as much as I did! We are HAPPY!! " The locally produced video can be seen by clicking the link here. The Pink Glove Dance campaign was created in 2009 by Medline Industries, a manufacturer and distributor of healthcare supplies, to honor healthcare workers and their patients.